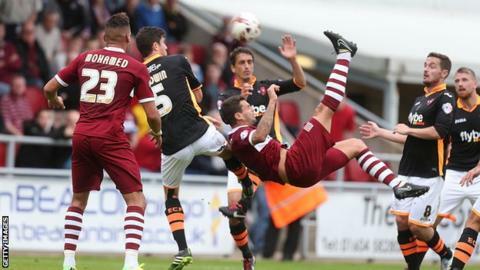 A fantastic late Marc Richards overhead kick gave Northampton Town three points against injury-hit Exeter City. Exeter's Liam Sercombe tested Matt Duke before the home side's goalkeeper was forced to tip over and prevent an own goal by teammate Zander Diamond. Cobblers substitute Ivan Toney hit the crossbar with an overhead kick and was then denied by goalkeeper Christy Pym. With a minute remaining Toney flicked on Ben Tozer's long throw and Richards beat Pym with an acrobatic finish. Match ends, Northampton Town 1, Exeter City 0. Second Half ends, Northampton Town 1, Exeter City 0. James Hamon (Exeter City) wins a free kick in the defensive half. Goal! Northampton Town 1, Exeter City 0. Marc Richards (Northampton Town) right footed shot from the centre of the box to the bottom right corner. Assisted by Ivan Toney. Corner, Northampton Town. Conceded by Christy Pym. Attempt blocked. Lawson D'Ath (Northampton Town) right footed shot from the right side of the box is blocked. Foul by Aaron Dawson (Exeter City). Arron Davies (Exeter City) is shown the yellow card. Attempt blocked. Joel Byrom (Northampton Town) right footed shot from outside the box is blocked. Attempt missed. Ivan Toney (Northampton Town) right footed shot from outside the box is close, but misses to the right. Substitution, Northampton Town. Richard Ravenhill replaces John-Joe O'Toole. Attempt missed. Liam Sercombe (Exeter City) left footed shot from the centre of the box is close, but misses to the left. Substitution, Exeter City. Aaron Dawson replaces David Wheeler. Attempt saved. Ben Tozer (Northampton Town) right footed shot from the left side of the box is saved in the bottom left corner. Attempt saved. Chris Hackett (Northampton Town) right footed shot from outside the box is saved in the bottom left corner. Corner, Northampton Town. Conceded by Pat Baldwin. Joel Byrom (Northampton Town) is shown the yellow card. Graham Cummins (Exeter City) wins a free kick in the attacking half. Attempt saved. Kaid Mohamed (Northampton Town) left footed shot from the centre of the box is saved in the bottom left corner. Attempt saved. Ivan Toney (Northampton Town) right footed shot from the centre of the box is saved in the bottom left corner. Ivan Toney (Northampton Town) hits the bar with a right footed shot from very close range following a corner. Marc Richards (Northampton Town) is shown the yellow card.